Grab your wig, platform shoes and let’s boogie! 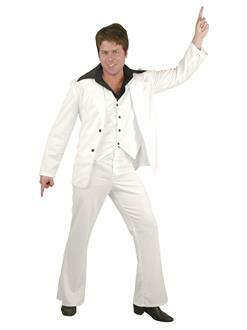 That’s right you will feel the groove in this Men’s Adult Dancing Fever Costume. Featuring an all-white super fresh jacket, attached vest, bell bottom pants, and butterfly shirt. Everything you need to get your hustle on for your 70's party!